This is Me - Rafa! By knowing a little bit about myself and how I learn languages it may inspire you to learn Portuguese with confidence. You clicked here because you may want to know more about me. This is the story about how I became passionate about languages, my own experience, as well as the research and study I did to prove that learning a language is fun, pleasant, rewarding and achievable. In short, great! Well, O meu nome é Rafa... OK, OK, my name is Rafael Tavares. Known as Rafa! I was born in South America – Venezuela – a Spanish speaking country. My parents are Portuguese and they were living there for quite a while when I was born. So I grew up bilingual – Portuguese (at home) and Spanish (in the streets and at school). I therefore ‘learned’ how to speak Portuguese and Spanish as a child – acquiring the language that could satisfy my needs. I lived in Venezuela up to the age of 10 and then moved to Portugal, with my parents where I lived for 17 more years. I also spent a lot of time of my childhood in Brazil where I also have family and many friends. It was in Portugal where I completed my first degree in Teaching and Education. I specialised in the field of Language Acquisition and Development. One day, I decided to move to London UK. I didn’t know how to speak English at all because I had studied French and Latin, but not English. When I landed in London, English was a completely different language, with a completely different structure and I felt quite lost. The degree I had helped me to find a solution. So, I started giving Portuguese classes to English speakers to survive but, even so, I needed to know how to speak English to communicate with my students. It was hard, I can tell you! I suddenly realised that if I used a method, I could learn English quickly. I knew a lot about acquiring a language as a child, because of my previous studies, but I didn’t know much about how to learn a language as an adult. So I decided to create my own method to learn a language, and I learned how to express myself with it! Little by little, I became so amazed with my accomplishments, that I couldn’t resist learning more and more about how to learn a foreign language. I kept on studying and trying to understand the intricacies of the English language, as well as to understand the way I was learning English, always comparing and contrasting it with the way I expressed myself in Portuguese. I managed to build and learn a reasonable amount of words, sentences and structures to survive in a great number of day-to-day situations. So, 3 years later, I decided to go further. I went to one of the best universities in London and I enrolled for a post-graduation in Modern Foreign Languages Education. What I realised with surprise when I was doing my studies in London was that countless people had already researched profoundly about how to learn a language. The more I studied, the more I came to the conclusion that what I was using as a method for learning a foreign language was right! The experts had discovered great techniques and had expressed great thoughts about the whole process but they expressed it in a language that almost only academic people could understand – the academic language. It seemed to me that they all were there in their ivory towers talking about things – extremely important indeed – but with little chance to be understood and accessible by "normal people", people like you and me. So I concluded that this was knowledge with little chance to be transferred to the practical world. I understood it like knowledge kept in a box to which not everybody could have access to. So, I decided to take that knowledge out of the box and develop a website and master a method that everyone could use in the practical world. I decided to collect all that information and create a way that puts the research done so far into something real. And here I am doing it. This is my passion, as I said, and that’s why I want to tell you what nobody told me when I most needed help. But to end this story, by using all this knowledge and by creating my own method, I reached a point where can speak English confidently to anyone. I built this site on my own. I am also able to sometimes impress English native speakers with the way I speak! I can deal with any situation, I can even compete with other English native speaker boys when chatting to girls! Joking! This is really crazy! Amazing! Superb! Now, the English native speakers are the ones who tell me that I use my accent as an advantage to get people interested in me, in talking to me, in being my friends. Well, in a way, I have to agree with them. Having an accent is charming, attractive and appealing to others. If you want to learn more about language accents, click here. Just to finish this story, later on, I eventually managed to get a job (yes, I couldn't be jobless forever...) and then another one, and one more. As per some of my latest jobs, I worked as a Senior Lecturer of Portuguese for 3 top universities in London where I taught both undergraduates and postgraduates (BA, MA and MBA students) Portuguese for business and for general purposes. I also had the privilege to coach, for several years, several diplomatic members of the Foreign Commonwealth Office in London, investment and retail bankers, members of the European Medicines Agency (EMA), among people with several other institutional areas of expertise. At the present moment, I provide language services for several organizations, and I teach Portuguese to people all over the world over the Internet as well. I just love what I do! I can't help it. Finally I would also like to share with you that I spend part of my time doing voluntary work, which gives me an incredible pleasure. I also freely reply to many emails with questions about the Portuguese language and culture I receive everyday from readers like you. I do believe in a more cooperative world, where we all help each other achieve their goals, rather than a competitive and selfish one, so let's help whoever we can, and make this a better world. Throughout the years I've realized that the more you help others, the more you get from others too. This is energy flowing, I believe. If you, for instance, would like to get into this flow of energy as well, and help me maintain this website, you can always make a donation by clicking on the button below. Your donation will be much appreciated. Please don't forget to notify me. And yes, this is Rafa, and here I am to share with you some good discoveries I have made, studied, and researched. I'm here to share with you what I have learned and created too. I’m also here to assure you that you can also achieve much, much more compared to what I have achieved so far! If so, please give me your hand and let me show you how to overcome the obstacles. Click the Mindset button to learn more about what you need to bear in mind to learn Portuguese quickly and without frustration. Do you feel like giving? If so, please click on the "Donate" button below to help me keep this website running. 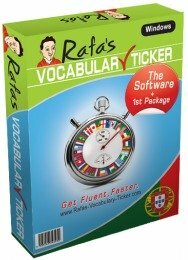 Rafa's Vocabulary Ticker Is A Unique Language Learning Tool I've Created To Help You Get Fluent Faster. And Have You Signed Up For My Free Newsletter Yet? I promise to use it only to send you Learn Portuguese with Rafa Newsletter. Click here to learn more about Rafa's Newsletter. 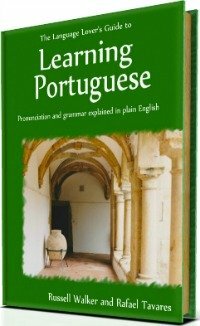 The Language Lover's Guide To Learning Portuguese is a study companion for you to understand the intricacies of the Portuguese Language. Check it out here! 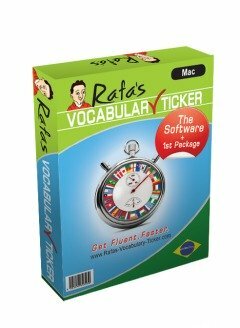 Software available to learn both, Brazilian and European Portuguese. Check it out!